There have been many books about the Holocaust - and there will be many more. What makes this one so memorable is Lale Sokolov's incredible zest for life. He understood exactly what was in store for him and his fellow prisoners and he was determined to survive - not just to survive, but to leave the camp with his dignity and integrity intact, to live his life to the full. Terrible though this story is, it is also a story of hope and of courage. It is also - almost unbelievably - a love story. Waiting in line to be tattooed, terrified and shaking, was a young girl. For Lale - a dandy, a jack-the-lad, a bit of a chancer - it was love at first sight and he determined not only to survive himself, but to ensure that Gita did, too. His story - their story - will make you weep, but you will also find it uplifting. It shows the very best of humanity in the very worst of circumstances. Heather Morris is a native of New Zealand, now resident in Australia. For several years. while working in a large public hospital in Melbourne, she studied and wrote screenplays, one of which was optioned by an Academy Award-winning screenwriter in the US. 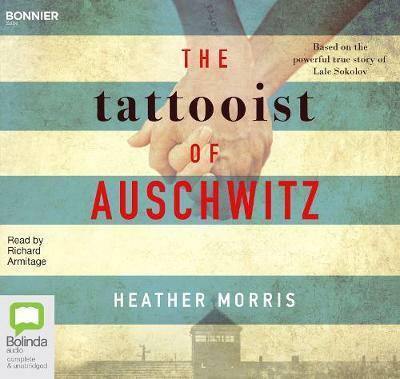 Heather originally wrote Lale's story as a screenplay - which ranked high in international competitions - before reshaping it into her debut novel, The Tattooist of Auschwitz. Richard Armitage is a British film, television, theatre and voice actor. Richard is most recognised for his role as Thorin Oakenshield in Peter Jackson's trilogy of The Hobbit. He also appeared in the hit BBC drama North & South, as well as a recurring role in Spooks and Robin Hood. Among Richard's theatre credits are an 18-month tour with the Royal Shakespeare Company playing Angus in Greg Doran's Macbeth and the lead role in Yael Farber's production of The Crucible at The Old Vic Theatre in London.